Salut tout le monde! I appreciate that you may be a little surprised to hear from me after almost 3 years of silence (!!) 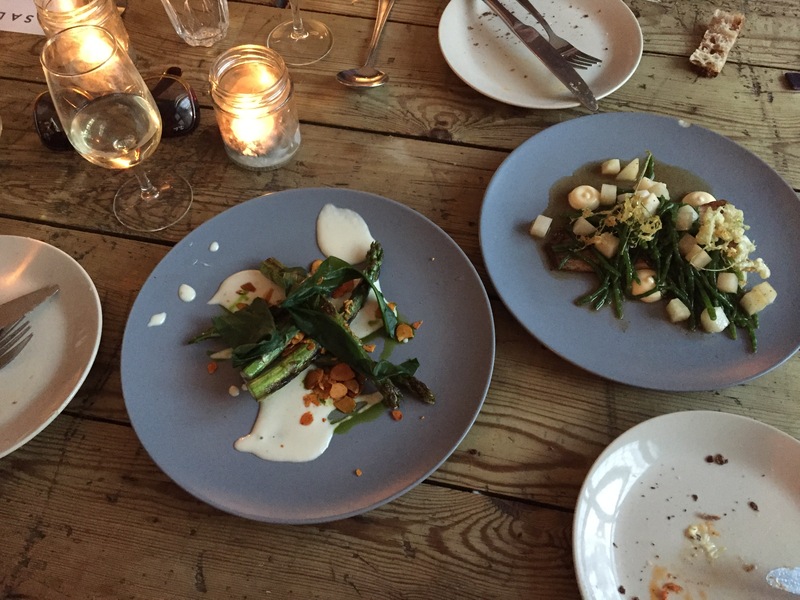 but I just have to tell you quickly about the completely delicious dinner I had at Salon in Brixton last night. Salon has been around for a little while but I don’t get out much these days so am a bit behind the times. The upstairs dining room sits above what used to be Canon & Cannon on Market Row and is a shabby-chic sort of set up with about 25 covers. The focus here is on locally sourced, seasonal ingredients supported by a cracking wine list that would benefit from a few more offerings by the glass. We were encouraged to take the set menu but settled on ordering a selection of things to share a la carte. Crispy and spicy ‘Nduja croquettes (I didn’t know either but ‘Nduja is a spicy type of sausage) with aioli were an excellent beginning followed by pork rillettes – one of my faves! A beautifully cooked plate of skate balanced perfectly with the appley tang of kohlrabi and the subtle delicacy of samphire. Alongside this some grilled asparagus with almond sauce and wild garlic and a dish of heritage tomatoes with black olive and basil. All these plates were beautifully presented and executed and completely and utterly delicious. Pudding was a total showstopper – strawberries with a balsamic jelly and black pepper sorbet. The Weissburgunder Pinot Blanc that went with all this was a cracking accompaniment. I would have liked more time with this wine list – a definite old world focus but an imaginative offering nonetheless and it is lovely to see a Portuguese white as the second wine on the list rather than the predictable Sauvignon or Pinot Grigio and a Spanish region such as Mencia being represented rather than Rioja. I will definitely be back here again, and soon. Watch this space… you may be hearing from me again! How nice (underestimated word) to see an old friend back in circulation. Always a treat to hear from the Kitchen Winery. Salon Brixton sounds amazing and would have had me running the engine of the car if the ceiling of an upstairs room had not just collapsed. When the work is completed and the chaos cleared, perhaps it is just the treat required. Thank you for the tip KW.